Intune app protection policies help protect your company data on devices that are enrolled into Intune. You can also use app protection policies on employee owned devices that are not enrolled for management in Intune. In this case, even though your company doesn't manage the device, you still need to make sure that company data and resources are protected. App-based conditional access and client app management add a security layer by making sure only client apps that support Intune app protection policies can access Exchange online and other Office 365 services. A managed app is an app that has app protection policies applied to it, and can be managed by Intune. You can block the built-in mail apps on iOS and Android when you allow only the Microsoft Outlook app to access Exchange Online. Additionally, you can block apps that don’t have Intune app protection policies applied from accessing SharePoint Online. For more information, see Enterprise Mobility pricing or Azure Active Directory pricing. A list of apps that support app-based conditional access can be found in the Azure Active Directory conditional access technical reference documentation. App-based conditional access also supports line-of-business (LOB) apps, but these apps need to use Office 365 modern authentication. 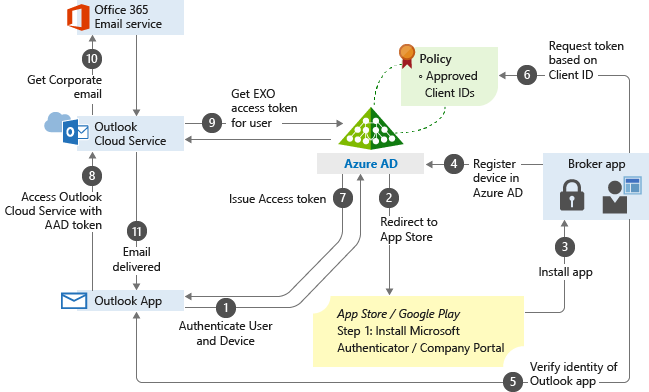 In this example, the admin has applied app protection policies to the Outlook app followed by a conditional access rule that adds the Outlook app to an approved list of apps that can be used when accessing corporate e-mail. The flowchart structure below can be used for other managed apps. The user tries to authenticate to Azure AD from the Outlook app. The user gets redirected to the app store to install a broker app when trying to authenticate for the first time. The broker app can be either the Microsoft Authenticator for iOS, or the Microsoft Company portal for Android devices. If users try to use a native e-mail app, they’ll be redirected to the app store to then install the Outlook app. The broker app gets installed on the device. The broker app starts the Azure AD registration process, which creates a device record in Azure AD. This isn't the same as the mobile device management (MDM) enrollment process, but this record is necessary so the conditional access policies can be enforced on the device. The broker app verifies the identity of the app. There’s a security layer so the broker app can validate if the app is authorized for use by the user. The broker app sends the App Client ID to Azure AD as part of the user authentication process to check if it’s in the policy approved list. Azure AD allows the user to authenticate and use the app based on the policy approved list. If the app isn't on the list, Azure AD denies access to the app. The Outlook app communicates with Outlook Cloud Service to initiate communication with Exchange Online. Outlook Cloud Service communicates with Azure AD to retrieve Exchange Online service access token for the user. The Outlook app communicates with Exchange Online to retrieve the user's corporate e-mail. Corporate e-mail is delivered to the user's mailbox.